When presented with general concepts or rules of thumb relating to personal finance, my brain resists automatic acceptance. My look-under-the-hood tendencies rebel when I hear a statement like “it's always better to invest rather than pay off debt” or vice versa. 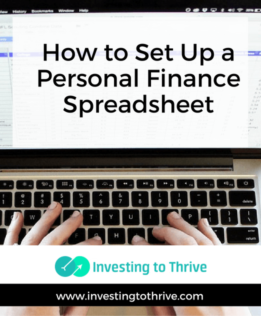 In this article, I'll explain the basics of setting up personal finance spreadsheets, including how to design formulas with financial functions like PMT (payment), FV (future value), and PV (present value). Determine what spreadsheet software to use. Two readily available tools are Google Sheets and Microsoft Excel. For a while I favored Excel because I received prompts when writing formulas. The latest version of Sheets offers similar explanations. The PMT function allows me to determine the payment amount for a loan. I'll have to enter the loan numbers (aka “arguments” or “values”) to use this function. As an example, I'll calculate the payment of a 4.5% fixed rate, 30-year mortgage loan in the amount of $150,000. I'll assume a complete payoff at the end of the term (the loan balance will become $0). In addition, I'll make the payment at the end of the year or month, not at the beginning. Press “enter” to complete the formula and get my result, which is $9,208.73. My result is an annual payment of a 30-year mortgage. To determine the monthly rate, I'll design the formula like this: =PMT(4.5%/12,30*12,-150000) = $760.03. Note that this number represents the principal and interest portion of a mortgage payment. The Future Value (FV) function allows me to project the future value of an account in a specific number of years or periods. Generally, this process involves knowing how much an investment account is worth today (if anything), the dollar amount of any periodic contributions (if any), the annual rate of return (I'll guess at this number), and the number of years from now until the future date. As an example, I'll determine how much an IRA will be worth in 10 years if I have $15,000 already saved, plan to contribute $5,000 annually for 10 years, and hope to earn 5% annually. Press “enter” to complete the formula and get my result, which is $87,322.88. My result shows me the future value of my IRA, which is based on its current value plus a series of equal contributions I plan to make over a period of 10 years. Using the present value function offers a different way for me to think about money. It makes me consider what a certain dollar amount in the future (or stream of income over a number of years) is worth right now. For example, let's say I want to grow an investment account to $500,000 in 30 years. If I know (or, more realistically, guess) a certain rate of return, I can calculate how much I need to invest today to reach my goal of $500,000. Press “enter” to complete the formula and get my result, which is $49,688.67. So, thirty years from now, $49,688.67 will be worth $500,000 — if I can get an 8% annual return. One application for this formula is to evaluate a pension plan offer. I can compare 1) the value of a lump sum payment with 2) a stream of payments over time — by determining their respective present values and comparing those numbers. At this point, I should mention that spreadsheets aren't crystal balls. They don't allow me to predict the future, even though the projections using present and future values may make me think I can. Still, personal finance spreadsheets can help me understand what might happen if I continue on a certain trajectory, like my investments grow at a certain, guessed-at level of annual returns. In addition, designing a spreadsheet can force me to identify and consider the variables that will influence my outcomes. Then, I can work to control these variables or take action independent of various possibilities. For example, if I decide I need more than $87,000 in my IRA, then I might contribute more, save longer, or try to determine if I can earn a higher rate of return. If I'm already maxing out my IRA contributions, I may consider saving over a longer period of time. Spreadsheets enable me to construct a model of a specific assertion. What interest rates and rates of return are being assumed? Are these numbers typical of most people's situations? Do these numbers represent my situation or my past experience? What other factors should I consider in addition to these numbers? After building a template — with formulas depicting how the numbers work — I can learn whether general assertions hold true and under what conditions. More importantly, I can determine not only how certain concepts may affect me but also decide what's best for me in specific situations. Understanding how to set up a personal finance spreadsheet and use financial functions can help inform decisions. Do you like using spreadsheets to make personal finance decisions? Would you rather design a spreadsheet yourself or use an online calculator? What types of spreadsheets have (or could) help you? I’m ALL about spreadsheets! I get frustrated when I’ve run numbers in an online calculator somewhere on the web and now my situation has changed and I have to try and find the one I liked again and re-enter everything all over. I took an excel class as an elective (wow am I a nerd) in college and it was seriously THE most useful class I took. I credit my edge knowledge for getting me a full-time job after an internship I completed. I love how you explained how to enter the time value calculations in excel-this is so useful for soooo many financial scenarios. Glad to hear that someone loves spreadsheets as much as I do. I also love time value calculations like you do. Speaking of the most useful thing I learned in college, the time value of money is the most useful concept I learned in my finance studies.